Since the fixture list was announced, one date in particular has been circled in football fans’ calendars: December 23rd, 2017, when the final Clásico of the season takes place. Just days away from the eagerly awaited clash, FC Barcelona’s international supporters groups are warming up for the game. The rivalry between the two best teams in Europe has become a tradition around the world. Proof of this is the large number of Barça supporters groups that have been formed in different continents in recent years, united by a passion for FC Barcelona. In the run-up to the game, we take a look at how the different ‘peñas’ worldwide prepare for El Clásico. 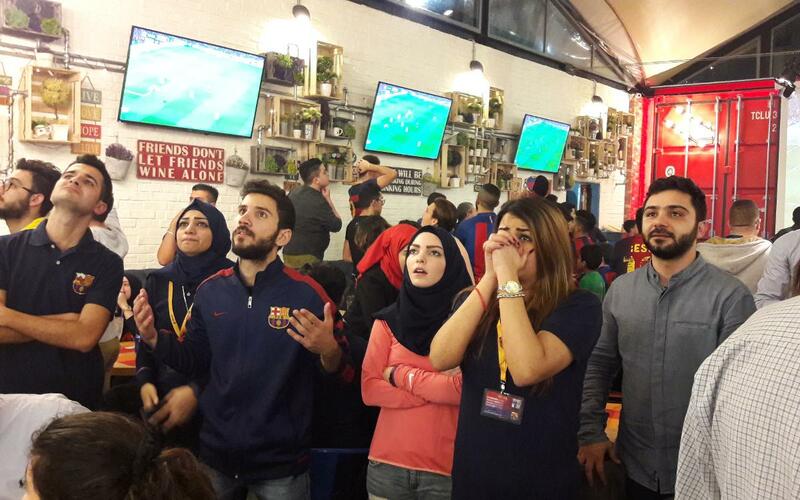 The FC Barcelona phenomenon is present in Morrocco. The north African country has become the place with the most Barça supporters groups outside Spain, with the opening of entities in Rabat and Kenitra taking the overall tally to ten. Four more are on the waiting list to become official supporters groups. For this Saturday’s Clásico, the Gent Blaugrana d’Anfa group from Casablanca have organised, along with a Real Madrid group from the same city, the first edition of the ‘Trofeo de la Amistad’ (Friendship Trophy). It is a charity event that takes place in the Sidi Othmane orphanage in the Morroccan capital. 120 children from six orphanages, three professional referees and more than 80 fans of both teams will be participants in a tournament in collaboration with the ‘La Marocaine des Jeux et des Sports’. sporting entity. During the day, 30-minute friendly games will be held between those taking part. Gent Blaugrana de Anfa membership is increasing constantly, and they hope to hold a fun day with the special appearance of former players from Morroccan sides Wydad and Raja. “These types of initiatives help build an incentive for sport amongst young people and, at the same time, instill respect for others despite any sporting rivalry between the two clubs,” said Youssef Bennani, the president of the group. For the second consecutive year, the Barcelona Cairo Fans, founded in 2016, are organising a large event around El Clásico. According to estimates by Dalia Haggag, the vice-president of the entity, more than 500 fans will watch the game on a giant screen installed in a cafe in the centre of the Egyptian capital. In order to lower the tension of the game, the group -who have a commemorative plaque at Gate 52 of the Camp Nou- will provide a menu at a reduced price for attendees. “Win or lose, we will give out souvenirs to the fans,” said Haggag. Active since 2001, the Peña Blaugranor de Lille in France have a tradition of meeting to watch the biggest LaLiga and Champions League games together. El Clásico, however, deserves something special. That’s why some 50 fans will meet in the ‘Le Gourmet Bar’, where a big screen will be installed. Attendees will be able to enjoy a dinner and the younger fans will be given a series of gifts. Anthony Romon, president of the group, explains that: “There will also be the annual charity tombola to help aid those with rare diseases.” This is yet another example of the charitable side of the supporters groups, who use many of the big events of the year to raise funds for social entities and charity projects. The most popular bar in Shanghai, ‘The Camel’ in the Puxi district, will host a meeting brought about by the Peña Ànima Blaugrana for El Clásico. It will be held in a private room, reserved for the more than 150 members. Thanks to the support of SPDBank and Beko, official FC Barcelona sponsors, a series of official FC Barcelona products will be raffled during the game, such as shirts, footballs, hats, dolls, scarves and wallets.